When Denzel Washington acts, he plays the characters with such extreme intensity it is difficult not to get taken deep into their world. I’ve not always enjoyed the films, but generally I have enjoyed his performances. Although there tends to be little variety between performances. 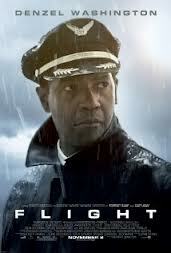 Flight tells the story of pilot Whip Whitaker who manages to land a commercial airliner in extremely difficult circumstances. However, the investigations afterwards reveal that he has a problem with substance abuse. What is very interesting is the way that, despite being a fairly deplorable character who treats those around him poorly, the audience is on the side of Whitaker throughout. Is this just because it is Denzel? Perhaps. Even if you’re not a fan of Denzel, the film is worth seeing just for the system malfunction and miraculous landing alone. Far too exciting. Denzel Washington was nominated for an Oscar for Best Performance by an Actor in a Leading Role and a Golden Globe for Best Performance by an Actor in a Motion Picture – Drama. John Gatins was nominated for an Oscar for Best Writing, Screenplay Written Directly for the Screen.